The Royal Ballet has announced promotions for the 2018/19 season. 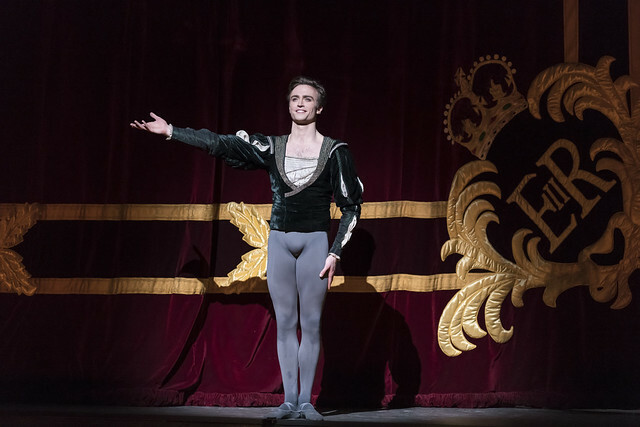 Matthew Ball been promoted to Principal dancer, the highest rank in the Company. Born in Liverpool, Matthew Ball joined the Company in 2013 after training at The Royal Ballet School. His repertory with the Company includes Albrecht (Giselle), The Prince (The Nutcracker), Prince Florimund (The Sleeping Beauty), Prince Siegfried (Swan Lake), Armand (Marguerite and Armand), Lensky (Onegin) and Romeo (Romeo and Juliet). His contemporary work includes Obsidian Tear, Woolf Works and Yugen by Wayne McGregor, Corybantic Games by Christopher Wheeldon and Symphonic Dances by Liam Scarlett. Matthew’s first major role as a Principal will be in La Bayadère as Solor. He will feature in Alastair Marriott’s new work, The Unknown Soldier, which premieres on Tuesday 20 November and commemorates the centenary of the end of the First World War. In December, he will perform with Matthew Bourne’s New Adventures at Sadler’s Wells, dancing the role of The Swan in Swan Lake. Calvin Richardson has been promoted to Soloist. Téo Dubreuil and Joseph Sissens are promoted to First Artist. Sae Maeda, Nadia Mullova-Barley, Joonhyuk Jun, Joshua Junker and Aiden O’Brien also become Artists, after joining the Company at the start of the last Season as Aud Jebsen Young Dancers, a programme which provides recently graduated dancers a year’s contract to work and perform alongside the corps de ballet of The Royal Ballet whilst receiving mentoring and coaching. Details of leavers and joiners will be announced in due course. Congratulations to Matthew Ball. Great to see a scouser as principal. It’s been lovely following his career. I’m sad to see Melissa Hamilton has not been promoted to principal. I love watching her dance. I hope to see her in more principal roles next season. Yes, I was hoping that Melissa Hamilton would become a Principal Dancer. She's even better than some older Principals!! Congratulations everyone! Very well deserved promotion of Matthew Ball. Especially happy for Fumi Kaneko and Calvin Richardson being promoted - would love to see more of them! Congratulations to all the dancers receiving promotions - fantastic news. I live in Korea so I really appreciate watching the RB online video clips of rehearsals - because of these I know who most of the dancers are and love hearing great news about them. Thank you Kevin O'Hare and the Royal Ballet! Congratulations to Matthew Ball on his promotion to principal. He is an outstanding dancer. Many congratulations to all - particularly well deserved for William Bracewell after his lovely interpretation of Siegfried in Swan Lake, and especially pleased too for stalwarts Tierney Heap and Mayara Magri who can always be relied upon for great performances. Thrilled for Matt,though it was clearly going to happen,and for Fumi.Disappoined for Reece Clarke,who deserves to be a first soloist. And all well deserved, but there do seem to be some names missing; mostly female dancers - this list shows nine promotions for men, and five for women. BBC Radio 3 played a piece from Giselle this morning in his honour and relayed the story when Matthew had to step in after the first act to dance with Osipova when David Hallberg popped his calf muscle. Very happy to see Mayara Magri, Fumi Kaneko, and Tierney Heap promoted to First Soloist!!! Three of my favourites! And of course Matthew Ball. Congratulations to all those promoted!! Also lovely to see Nadia enter the company as an artist, after seeing her in the documentary about The Nutcracker not so long ago. Well, in fact there are only eight promotions of established members of the Company: three female promotions (Kaneko, Heap,Magri) and five male promotions (Ball, Bracewell, Richardson, Dubreuil and Sissens), all coming from within the ranks of RB. The other six are apprentices who are now officially contracted to join the corps de ballet as Artists so they are Joiners, not promoted dancers. Congratulations Matthew Ball , after all the hard work, sweat, blood & tears , well deserved indeed . Melissa Hamilton should be promoted as well this year . Congratulations to everyone, especially to Calvin, Joseph, Tierney, William and Fumi, who have consistently put in impeccable performances in every role they've had, whether in the corps or in a featured part. Congratulations to all! So happy for Matthew Ball, especially since I was there when he had to step in for David Hallberg in Giselle, that was a great job! Not surprised at all with Matthew’s promotion! With the attention he’s been getting lately and the many roles he’s dancing, it was only a mater of time to see him becoming a Principal. I’m also delighted to see Mayara and Fumi becoming First Soloists, they definitely deserve it. Mayara’s promotion was very well timed, but for the past few years I had always felt as if Fumi was being passed over. Thankfully not! Calvin Richardson is a gorgeous dancer and a promise for the company as well, good to see him being recognized. The only dancer I was expecting to be promoted this season who wasn’t is Reece Clarke! But then again, his time is definitely coming as well. I completely agree with you about Fumi and Mayara. Very happy they were promoted. Absolutely delighted for Matthew Ball. I was present when he stepped in for Act II of Giselle. I also saw him partner Osipova twice in Swan Lake and I think it is a very special partnership. He is a very versatile dancer, equally at home in classical roles and in contemporary repertoire. I hope very much that Beatriz Stix-Brunell will be given more opportunities in 2018/19. I think she is an outstanding dancer and I look forward to seeing her promoted to principal soon. Of the other promotions this tine round, I'm very pleased to see Tierney Heap become 1st soloist. I've been so impressed with her work this year especially in Wheeldon's Bernstein ballet and in the Spanish dance in Swan Lake. This list of promotions is great. All these dancers can adapt to a wide range of choreography, all invest themselves totally in the role they are playing, are all technically secure, and all have that 'extra something' which draws the eye whenever they are on stage. Huge congratulations to all. Many congratulations to all those promoted - thoroughly well deserved in every single case! I'm especially thrilled for Matthew Ball and William Bracewell, both of whom have been exceptional in every role I've seen them dance. I'm very much looking forward to seeing what they, and the whole Company, bring to the stage over the next season. It can't come soon enough! Great news on all the promotions but really would like to see Marcelino Sambe promoted to Principle his dancing is infectious and his presence lights up the stage. he's had a rapid ascent since starting the royal ballet and was promoted again just last year, his time will come! I fully agree with you . Marcelino was only very unlucky to be injured the way I heard he was during part of the season. If not, and in my humble opinion, he would be the one that would more deserve to be promoted to Principal . I hope it will happen next year. Congratulations Matt and Mayara !!!! some news worthy of the cycle today, elevating people who actually deserve it, congrats all around! Congratulations to all dancers that have been promoted especially Matthew Ball as Principal and the very expressive William Bracewell who joined the company last season and was exceptional as Siegfried in the wonderful new production of Swan lake. Many congratulations to all. So pleased Matthew Ball has been promoted to Principal, well deserved. Also pleased to see Stanislaw Wegryzn is now an Artist in the Company. I remember seeing him as Prize winner at the Prix de Lausanne on Youtube in 2017. Congratulations to all but especially Joseph Sissens. I have seen him dance from a young age and is well deserving of this promotion. Congratulations to all the promoted dancers, they all deserve it so much! But I am especially happy for Fumi Kaneko, who had to wait a little for this promotion and absolutely thrilled for William Bracewell and Calvin Richardson, who both had an amazing season! Cant wait for the next season with new great opportunities for these dancers! Congratulations to Matthew on a well deserved promotion. Congratulations also to all the others who have been promoted. I'm specially thrilled for the promotion of Mayara. She's one of my favorites. Congratulations to the rest of dancers who have been promoted!!!! Each one of you is really special. I 'm disappointed for Melissa Hamilton. She's so good and really stands out among her fellow First Soloists. And..what about Cesar Corrales???? Isn't he supposed to be in the company now???? No promotion for Reece Clarke! Scandalous. I feel even sad that I am still waiting for it. I think Yuhui should leave royal ballet.. Particularly disappointed at Melissa Hamilton not getting promoted. She was wonderful in Manon and deserves a principle position at Royal. Also Reece Clarke should have been pushed up too Congratulations to Matt Ball who was great this year. Brilliant promotion for Matthew Ball - so well deserved!! Looking forward to many years seeing you dance!! Our total treat!! Congrats!! So pleased to see Joseph Sissens has been promoted - what an exceptional young dancer! Congratulations to all the dancers who have been promoted, the whole company have given brilliant performances this year so standing out is particularly impressive. It’s fantastic to see Matthew Ball’s talent and artistry rewarded, he is absolutely sublime. Really delighted for Calvin Richardson! He’s a fantastic dancer! May be the best in the whole company. Delighted for the brilliant Mayara Magri my favourite dancer and a truly humble person. Congratulations to all promotees. How lucky we are to have such wonderful dancers in the company. The fact that there are so many others who could/should have been promoted is testament to the depth of talent that Kevin O'Hare has to call on. Yes, I would like to have seen others elevated but their time will come. Whatever Kevin does is OK with me. Matthew Ball is a great danseur noble, a superb partner for Natalia Osipova in Giselle. Really happy for Mayara! Disappointed for Yuhui, once again. I think she should consider working elsewhere. Congratulations to Matthew Ball but it is very disappointing that Yuhui Choe and Melissa Hamilton haven't been promoted. Fantastic news on Matthew Ball. He has developed from a promising start in to an exceptional dancer, utterly majestic in princely roles and expressing great emotional depth. Like others, I’m also disappointed that Melissa has not been promoted, as I relish the opportunity to see her perform. But I’m not at all surprised. I can’t help feeling that she would almost certainly have been promoted by now had she not decided to go off to Dresden. Paving the way for Akane, Francesca and Yasmine to leapfrog her. The failure to promote Melisa Hamilton is bizarre and makes me wonder what's really going on. She exploded into the company 2007 into 2008 becoming an obvious choice for Macgregor, since then developing into the best Macmillan dancer in the Company. In a recent Swan Lake, she commanded the stage as the Hungarian Princess even with Odile dancing. She's danced the roles and Principal is therefore about recognition; come on Kevin, which boxes are not being ticked, I think we should be told. Thoroughly deserved by all and am especially pleased about Matthew Ball and Mayara Magri. I still fail to comprehend why the brilliant Melissa Hamilton has sadly been overlooked again to be promoted to Principal. I can only agree that Reece Clarke is due for promotion. ROH can not afford to lose him ! I agree about Miss Choe. I always book for her performances. She is magnificent. She radiates charm and dignity. It's very bizarre to me that Yuhui Chloe has not been promoted to principle when she's already danced several of the roles. I believe she's been a first soloist for about 10 years now. Some of the dancers who are principles are not quite as deserving of the title in comparison to Choe. I also want to know why Yuhui choe is still not promoted she is wonderful (and beautiful)! I have seen stunning performances this year from Melissa Hamilton and Beatriz Stix-Brunell, so was disappointed neither were promoted. This situation saddens me. I am puzzled as to why an existing principal dancer who has never danced the principal roles in 'Swan Lake' and 'Romeo and Juliet' is able to retain their principal status, thus blocking the chances of other dancers - it does not make sense. It's a poor management decision Mr O'Hare !! Yuhui Choe passed over for promotion to prima ballerina again. That's not only scandalous, that's criminal. Anybody called in to pinch hit as Aurora in SB for an injured Natalia Osipova deserves to be promoted to principal out of hand. I do think it's time now that the RB address their failure to promote Yuhui Choe, especially when so many of their paying audience members are clamouring for her promotion. What can possibly be the reason?!! It is very clear that she is hugely popular with audiences and she has already danced many of the principal roles. She is one of the best ballerinas in the world yet she continues to be left on the shelf, it's absolutely heart-breaking. We want to see her dance exclusively principal roles. Does the RB not care at all what their audience thinks? It's shameful. Good luck in whatever you do and looking for further promotion on your return. when is yuhui going to be promoted to principal?!? shes a phenomenal dancer and she deserves it. i cant believe shes passed over again. Yuhui Choe passed over again. Congrats to everyone but this is so disappointing. when will Yuhui Choe be promoted? her promotion has been long overdue! Yuhui Choe being overlooked again. I wonder what's going on? Or maybe she discussed it with O'Hare? Some dancers have a reason not to promote. On the other hand she is the one who deserves it the most. I feel other dancers who have been principles for a long time aren't as deserving. Yuhui Choe is now in her mid-30s, so almost too late. On the other hand she looks young and fresh compared to other dancers her age. I think we deserve a explanation as to why there is no promotion for Yuhui Choe.